Get two high performance controls for displaying lists of bound data with ComponentOne ListBox™ for WinRT XAML. Display lists with tile layouts or with optical zoom using the C1ListBox and C1TileListBox controls. These controls support UI virtualization so they are blazing-fast while able to display thousands of items with little-to-no loss of performance. The ComponentOne ListBox controls support both horizontal and vertical orientation, allowing for more layout scenarios. The C1TileListBox can arrange its items in both rows and columns creating tile displays. Specify the size and template of each item and select the desired orientation. The C1ListBox control supports optical zoom functionality so users can manipulate the size of the items intuitively through pinch gestures. The zooming transformation is smooth and fluid so the performance of your application is not sacrificed. The ComponentOne ListBox controls support UI virtualization so they are blazing-fast while able to display thousands of items with virtually no loss of performance. You can determine how many items are rendered in each layout pass by setting the ViewportGap and ViewportPreviewGap properties. These properties can be adjusted depending on the scenario. In order to have the highest performance imaginable, the ListBox controls can render items outside the viewport in a preview state. Like the standard ItemTemplate, the Preview template defines the appearance of items when they are in a preview state, such as zoomed out or during fast scroll. The controls will then switch to the full item template when the items have stopped scrolling or zooming. 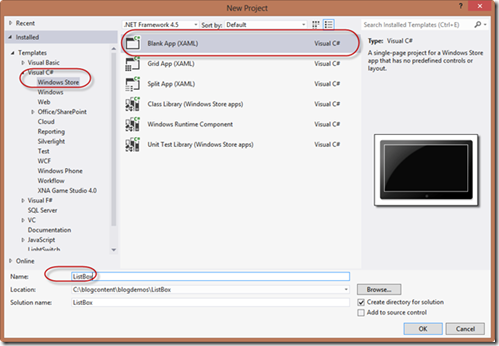 In this step, you'll create a WinRT XAML application in Visual Studio using ListBox for WinRT XAML. 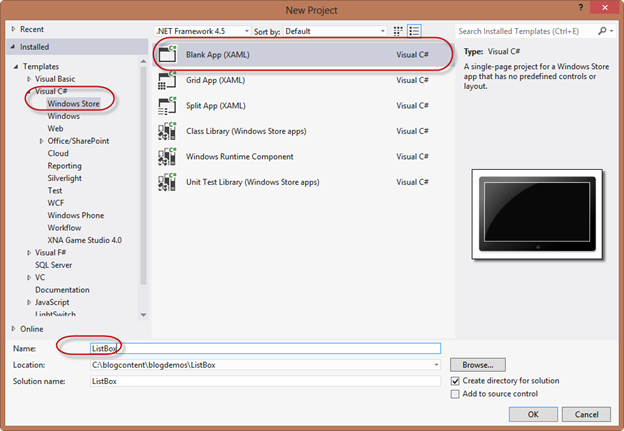 In Visual Studio 2012 Select File | New | Project. In the New Project dialog box, expand a language in the left pane, under the language select Windows Store, and in the templates list select Blank App (XAML). Enter a Name and click OK to create your project. Open MainPage.xaml if it isn't already open, place the cursor between the and tags. The TextBlock and ProgressBar will indicate that the C1ListBox is loading. 5. Navigate to the Toolbox and double-click the C1ListBox icon to add the control to the grid below the tag. This will add the reference and XAML namespace automatically. This gives the control a name and customizes the binding, background, visibility, size, and refreshing ability of the control. This markup adds data templates for the C1ListBox control's content. Note that you'll complete binding the control in code. 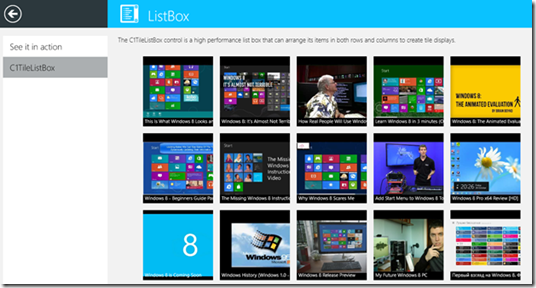 You've successfully created a WinRT style application containing a C1ListBox control. In the last step, you added the C1ListBox control to the application. In this step, you will add code to display images from a photo stream. The code above pulls images from Flickr's public photo stream and binds the C1ListBox to the list of images. You have successfully added data to C1TileListBox. In the next step, Step 3 of 3: Running the ListBox Application, you'll examine the ListBox for WinRT XAML features. The application will appear, displaying an image. Use the scroll bar on the right of the control, to scroll through the image stream. Or, if using a mouse hold the ctrl key while using the mouse wheel to zoom in and out. If you have touch capabilities, try pinching to zoom an image. Congratulations! You've completed the ListBox for WinRT XAML quick start and created an application using the C1ListBox control and viewed some of the run-time capabilities of your application.